A man smokes next to a 'No Smoking' sign in Shanghai. 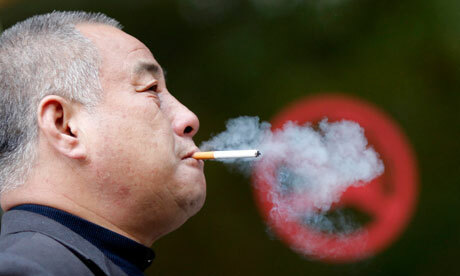 China banned smoking at all indoor public venues from 1 May. China has introduced a ban on smoking in indoor public spaces, hoping to thin the ranks of its 300 million smokers and protect the health of others. But in a country where half of all men smoke and where it is common for people to light up in hospital waiting rooms, there is a feeling the measure may have little effect. The new regulations do not specify any penalties for smokers who infringe the ban or business owners who let them. Instead, they say owners should put up conspicuous non-smoking signs, promote non-smoking and designate staff members to tell customers not to smoke. The regulation, issued by the ministry of health, bans smoking in places such as hotels, restaurants, theatres and waiting rooms at railway stations and airports. Most workplaces are not included. China should have introduced the measure in January under the commitment it made when it signed the World Health Organisation’s framework convention on tobacco control several years ago. Many believe that efforts to tackle the country’s tobacco habit have been hindered by the vast profits it yields for parts of the government. The tobacco monopoly is state-owned and, according to state media, as much as a 10th of the country’s tax revenues come from the industry. Yang Gonghuan, director of China’s National Office of Tobacco Control, welcomed the ban and told state news agency Xinhua that the guidelines made the responsibilities of business owners clearer. “It is realistic to demand a bigger role for these business owners in dissuading smokers,” she said. But she also said it would take a long time to have an effect and that it needed to be revised in future to introduce concrete details on enforcement and supervision. Anti-smoking campaigner Wu Yiqun told China Radio International the government should do more to educate people by putting pictures on cigarette packets showing the effects of smoking. Research by the Chinese centre for disease control found that smoking-related diseases killed 1.2 million Chinese people in 2005 and predicted the death toll would rise to 3.5 million by 2030. Studies suggest as few as one in four of the population are aware of the health risks. Roughly half of all Chinese men smoke, though relatively few women do, and compliance with existing non-smoking zones is poor. It is not uncommon to find ashtrays and complimentary matches in non-smoking hotel rooms, or for people to light up in hospital waiting rooms, where it was supposedly banned. In Guangzhou â€“ hailed by Xinhua as the city with the toughest anti-smoking measures in China â€“ the maximum fine for flouting the ban is 50 yuan, or about Â£5. While staff at one bar in Beijing said they had stopped putting ashtrays on tables and would put up non-smoking signs, employees at a nearby restaurant said they had not heard of the regulation so had no plans to make changes.